Pregnancy is one of the most nutritionally demanding periods of a woman’s life. Energy needs increase about 15 percent during pregnancy. These needs can be met by eating larger portions, eating more often and taking dietary supplements as indicated by a health-care professional. Expectant mothers should enjoy a wide variety of nutritious foods for their own good health and the health of their unborn child. Contaminated and mishandled foods are linked with food-borne illness outbreaks. The following recommendations help keep food safe for pregnant women and their unborn babies from the grocery store to the kitchen. ■ Always check labels for food safety information. ■ Do not buy foods that are past their “sell by,” “use by” or “expiration” date. ■ Do not buy foods that are displayed in unsafe or unclean conditions. ■ Check for damaged packaging — don’t buy dented cans, leaking cartons or bottles, ripped boxes or packets and packages with broken or pierced seals. ■ Avoid buying bulging cans or swollen chilled food packages. ■ Avoid food products in loose vacuum packs. The packaging should be tight around the food. ■ Avoid moldy or discolored produce. ■ Avoid chilled products that are not cold to the touch and frozen foods that are not frozen solid. ■ Avoid hot foods that are not steaming hot. ■ Make the grocery store your last stop on your list of errands. Perishable foods, such as dairy foods, meat and poultry, should not be out of refrigeration for more than two hours (one hour if the temperature is above 90 F). These foods provide calcium, protein and vitamin D.
■ Choose only pasteurized (heat-treated) milk, cheese and yogurt. Unpasteurized or “raw” products may contain harmful bacteria. The food label will tell you if a product is pasteurized. ■ Check the dates. Milk and milk products carry “sell by” dates. The store must sell the product by this date. For the freshest product, choose the one with the most distant “sell by” date. ■ Avoid buying soft cheeses made from raw milk such feta, brie, camembert, blue-veined cheeses, queso fresco, queso blanco and panela. These cheeses may contain the bacteria Listeria. Instead, select hard cheeses, pasteurized cheeses and spreads, pasteurized soft cheeses, cream cheese, cottage cheese and mozzarella. Listeria is a type of bacteria that can cause miscarriages. These foods provide vitamins, minerals and fiber. ■ Avoid buying seafood salads found in deli cases or on a salad bar. Many ingredients in seafood salads support the growth of bacteria. Also, long storage times (even when properly refrigerated) allow Listeria to grow. ■ Avoid buying raw sprouts including alfalfa, clover, radish and broccoli sprouts. Washing sprouts may not make them safe to eat if the seeds they grew from contain harmful bacteria. ■ Select only pasteurized fruit juices. Check the label to be sure the product is pasteurized. Frozen, concentrated and canned juices have been heat-treated and are safe to drink, but may not be labeled. Fresh squeezed juices are not pasteurized and may contain harmful bacteria. These foods provide protein, iron and zinc. 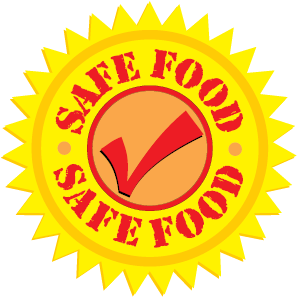 ■ Avoid buying refrigerated smoked or precooked seafood, such as salmon, trout, shrimp, crabmeat, tuna and mackerel. It may be labeled as “kippered” or “lox.” Instead, choose canned tuna, salmon and crabmeat, which are heat-processed to kill harmful bacteria. ■ Check eggs before purchase. Avoid buying cracked or damaged eggs. ■ Avoid “cross-cart contamination.” Uncooked foods may contain bacteria that can be spread to cooked foods, resulting in cross-contamination. ■ Place packaged meat, poultry and fish into separate plastic bags before placing in your shopping cart. Bacteria on the meat can spread to other foods in your cart. Being low in moisture, these foods pose few food safety risks. Store them in a cool, dry place at home and use within the date listed on the package. Read the labels to learn more about nutritional content. Foodborne illness can be prevented by taking some precautions at home. ■ Hand washing can help prevent foodborne illness. Always wash hands well in hot, soapy water for at least 20 seconds. ■ Use separate cutting boards and utensils when preparing raw foods that require cooking and cooked or ready-to-eat foods. ■ Never place cooked food on a plate that previously held raw meat, poultry or seafood without first washing the plate. ■ Wash knives, cutting boards and food preparation areas with hot, soapy water after they come in contact with raw meat, poultry and seafood. ■ Use paper towels (instead of a cloth or sponge) and a disinfecting cleaning agent to clean up messy spills from potentially hazardous foods. ■ Place raw meat, poultry and seafood on the bottom shelf of the refrigerator to prevent their juices from dripping on other foods. ■ Heat hot dogs to steaming hot before eating. Follow the instructions on the package or boil for at least five minutes. ■ Heat lunch meats and deli meats to steaming hot before eating. Use a microwave, oven or grill. If you prefer lunch meats cold, they can be heated and then cooled before eating. ■ You can’t tell it’s done by how it looks! Use a food thermometer. Insert the thermometer in the thickest part of the food, away from bone, fat or gristle. Every part of the turkey or chicken should reach a safe minimum internal temperature of 165 F. Cook beef, pork, veal, or lamb roasts and steaks, and fish to 145 F*; cook ground beef and egg dishes to 160 F.
■ Refrigerate or freeze perishables, prepared food and leftovers within two hours at or below 40 F.
■ Never defrost or marinate food on the kitchen counter. Use the refrigerator, cold running water or the microwave to thaw foods safely. ■ Use perishable foods that are precooked or ready to eat as soon as possible. If you cannot eat the food within three to five days, properly wrap and freeze it. ■ Divide large amounts of leftovers into small, shallow containers for quick cooling in the refrigerator. Don’t forget the most basic of food safety rules: When in doubt, throw it out! ■ Avoid ordering raw or undercooked seafood, such as sushi, ceviche, oysters, clams, mussels and shrimp. ■ If meat or poultry is not cooked to “well done,” send it back to be fully cooked. ■ Ask for deli meats to be heated to steaming hot. ■ Ask your server or the restaurant manager if the caesar dressing, homemade mayonnaise, hollandaise sauce or homemade ice cream is made with raw eggs. Products made with raw eggs are unsafe to eat. ■ Ask your server to hold the raw sprouts. ■ If you are not sure if a specialty cheese has been pasteurized, ask the manager to check the label for you. ■ If you are not sure if juices have been pasteurized, ask your server or the manager before ordering.